Over the last couple months, I’ve been eyeing various landing and taxi light setups, trying to figure out what I want to do for my airplane. I’m not super keen on the leading edge landing/taxi light setup right now, so I want to focus on putting all the lights in the wingtips. There is a Van’s wingtip landing light kit that puts two MR16 sized bulbs in each wingtip. Supposedly, you can aim one set forward for landing (also recognition) lights, and aim the other set down for taxi. I’ve read on the forums that people haven’t been too thrilled with this setup using the standard 35W and 50W halogens that van’s provides. Something about not getting enough light on the centerline of the aircraft, where you need it for landing. I have also read, however, that with the MR16 HID upgrades from somewhere like www.planelights.com or duckworksav.com, there is plenty of light to go around. Sweet. I’ll go with those. 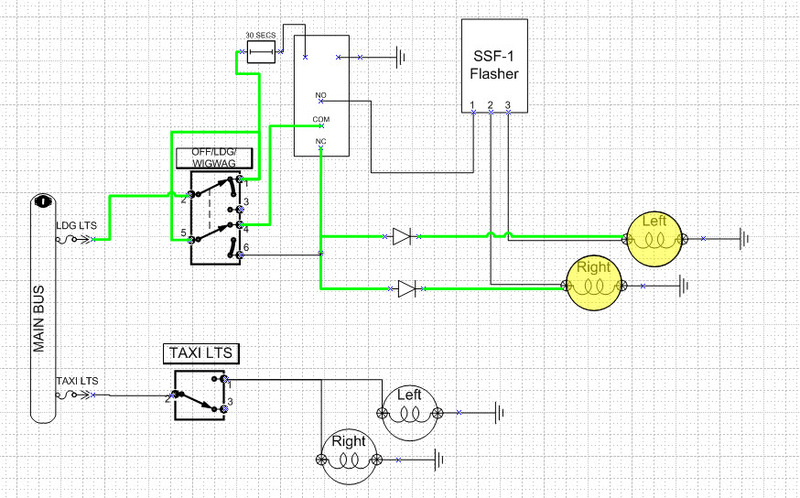 (This is the same as Mike Bullock’s setup, except instead of both sets being 50W, I’ll probably use one set of 50W HIDs for landing, and use a 35W (pronounced “less expensive”) for taxi lights. But then we come to wig-wag. 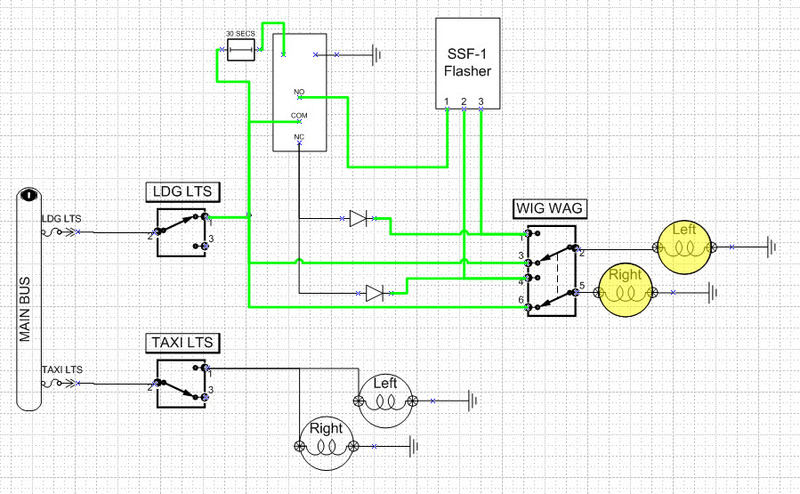 I think wig-wag (pulsing lights) for the landing lights is a requirement safety wise, so I am planning on incorporating a wig-wag circuit into my landing lights. Procedurally, I could just wait 30 seconds after turning the landing lights on before turning on the other switch, pulsing them, but who can remember that 100% of the time? 30 seconds is just about the time it takes between turning the lights on for takeoff and liftoff. This is not the right time to be reaching down for another switch. I’d rather flip both switches ON, and have them automatically warm up before starting to pulse. Enter xevision. 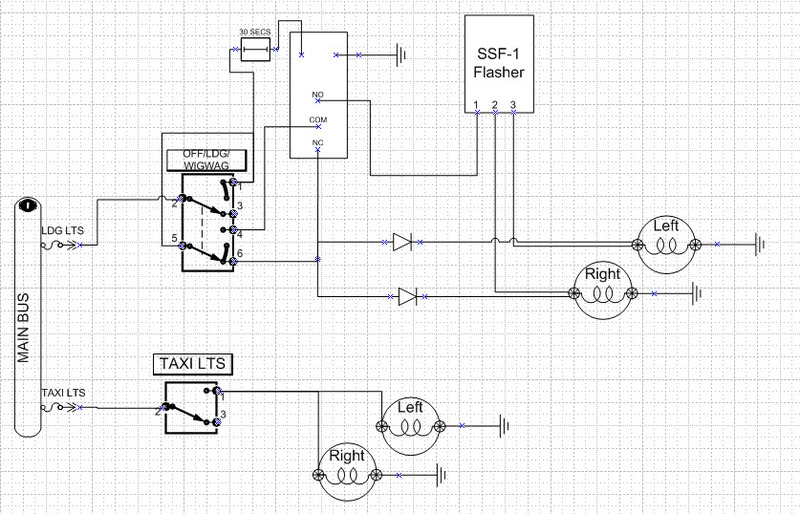 They have a multiple-hundred-dollar HID flasher box that will work great for this application. Except I’m an engineer, and I love a good problem to solve, and I don’t have hundreds of dollars laying around. Enter Microsoft Visio and B&C. 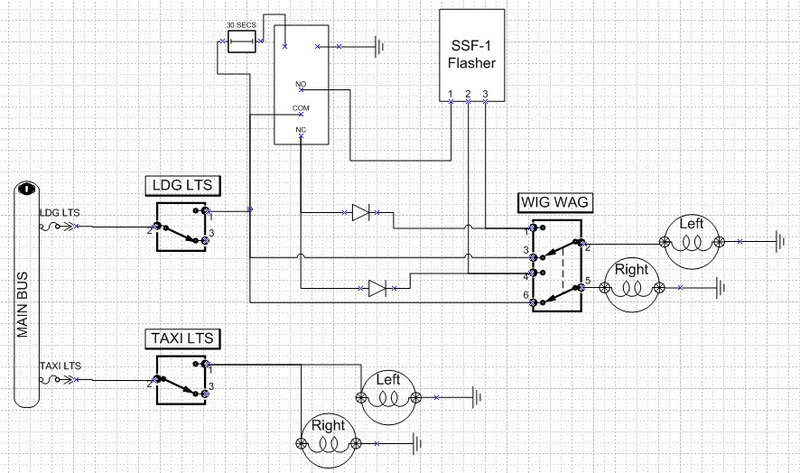 Using Bob N’s Low Cost Wing Wag Alternative document (page 2.0) as a starting point, I drew up a concept for a landing and wig-wag circuit with a delay timer (haven’t figured out the timer circuit yet, but it’s a relay trigger, so I’m going to simulate it with a switch for now). Keep in mind, I could combine the functions into a 2-10 switch (similar to page 3.0 of the wig-wag document), but then I couldn’t use the switch-breaker I’m planning to use in place of the regular switch I have depicted. 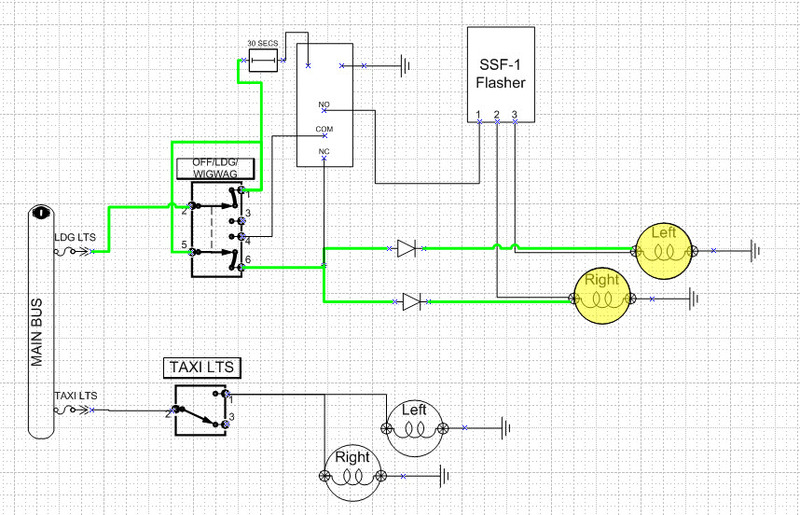 Maybe this circuit is a good candidate for an inline fuse…I’ll sort that out later. Oh, and I’ve shown the HID lights here as just normal lights. You get the idea, though. UPDATE: After testing, I realized I need diodes in here on the flasher side of the 2-3 switch near the NC part of the relay to isolate the two lights. I’ll try to draw them in. 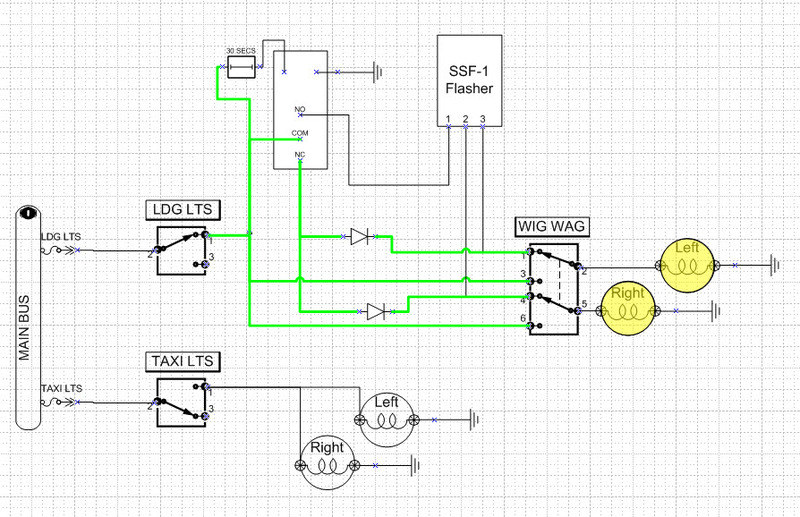 Okay, for the first iteration (see next picture), I’ve turned on the LDG LT switch. +12VDC is now available through the switch, and is going to the following places: 1) to the timer circuit, starting the 30s timer (mechanism TBD), 2) The COM terminal on the SPDT Relay (and therefore through the NC terminal to both of the WIGWIG ON terminals of that switch), and 3) to both of the WIGWIG OFF terminals of that switch. Summary, the 30s timer as started, and both landing lights are on steady. LDG ON for less than 30 secs, WW OFF. At this point, if we turn the WIGWAG switch ON (see next picture), the landing lights are still getting power, but through the NC terminals of the relay, so they are both still on steady. This is good, because we don’t want them to pulse before the 30s of warm up time as elapsed. Okay, let’s turn the WIGWAG switch back off, and let the 30 seconds elapse. Now. +12VDC is now available through the switch, and is going to the following places: 1) to the timer circuit, which has now closed the relay, 2) The COM terminal on the SPDT Relay (and therefore through the NO terminal to the SSF flasher, and then to both of the WIGWIG ON terminals of that switch), and 3) to both of the WIGWIG OFF terminals of that switch. 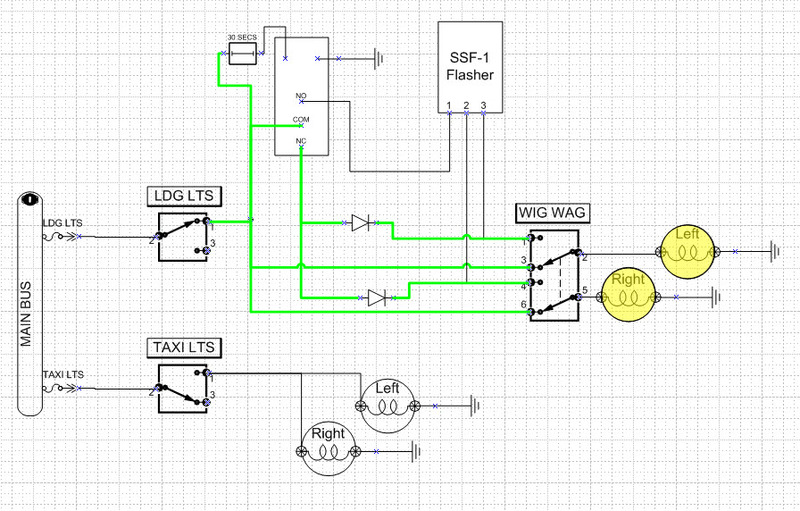 Summary, the 30s timer has elapsed, but since the WIGWAG switch is off, we are still getting steady lights. LDG ON for greater than 30 seconds, WW OFF. 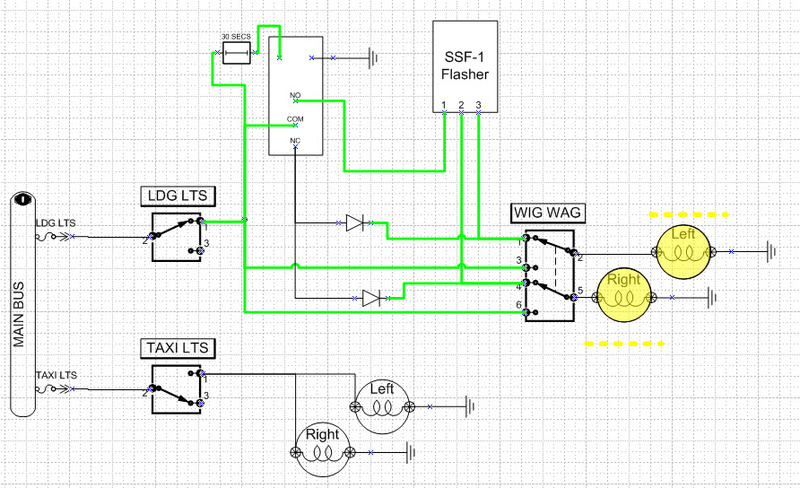 Finally, we move the WIGWAG switch to ON, and the lights are being powered through the LDG LT switch, the trigger relay, which closes the SPDT relay, the SSF flasher, and the WIGWAG switches ON terminals. 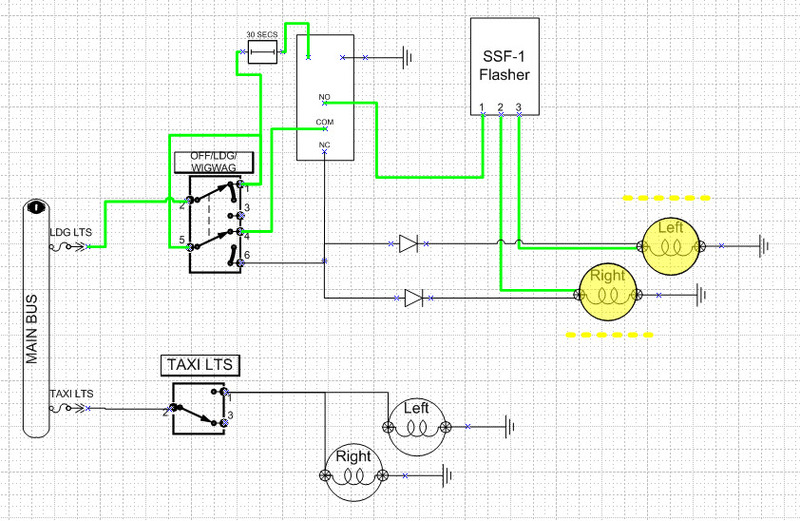 Basically, the timer won’t let power go through the flasher until 30s after the landing lights are turned on. Of course, I was motivated enough to figure it out. Wig Wag on, but before the 30 seconds had elapsed. Still steady lights. Then, after the 30 seconds, we have flashing. Now, I figure I’m missing some diodes or something somewhere. Anyone have any suggestions? This entry was posted on Monday, October 11th, 2010 at 5:30 pm and is filed under Wiring. You can follow any responses to this entry through the RSS 2.0 feed. You can leave a response, or trackback from your own site.